During a power outage, a 9 volt battery, in the motor, allows the head or foot sections to be lowered or raised 9 times. Semi-Electric means motor re positions head and foot sections. Leg and deck height are adjustable without tools. Complete with frame, head/foot boards, and retractable sockets for proper placement. Easy Assembly: Color Coded step by step assembly makes it simple for anyone to put together. SemiElectric: Raises both the Head and Legs, but not the overall height of the bed. Easy to set up. Bed ships in two cartons. Shaft stores under frame when unassembled. 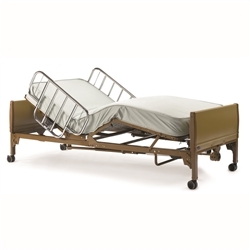 Full Electric: Raises both the Head and Legs, but also the overall height of the bed. Unique completely self-contained motor provides smooth quiet operation. Battery back up in motor can be used to raise or lower head or foot section about 9 times during power outage. High-Impact Bed End Panels are more durable, scratch-resistant and washable for easy cleaning. 6-Function Hand Control Pendant The Electric Hand Control features bright, universal symbols and allows residents and staff to easily operate the comfort controls of the bed. Ideal positioning and comfort are offered by separate head deck, foot deck and bed height functions. Ease of movement and secure locking with three-inch braking casters. Hi Low Bed drops to 8.5" height making it one of the lowest beds on the market and raises to 27" at the highest setting. Hi Low Bed drops to 7" height making it one of the lowest beds on the market and raises to 30" at the highest setting. Hi-Lo setting is ideal for users who potentially could fall out of bed as well as caregivers in high position for adjusting patients and loved ones at the proper height for care. Hospital beds come in full-electric, semi-electric, and manual operation. 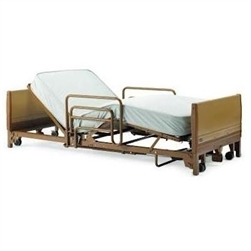 Hospital beds also come in standard, full, queen and bariatric sizes. Available mattress types: foam, pressure reducing foam, innerspring, and high performance fiber. We are here to help! Call Wheelchairauthority.com at 866-218-0902 today!